def not your average puzzle game, and def not all about matching things up as much as it seems. 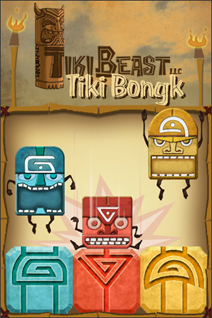 drag the blocks to match the color of the Tiki smashing them. a chain reactions occur when several of the same color blocks are stacked together. you will need to plan out your bongk'ing to get the highest scores. i love the tiki motif, as much i do the tiki room at disneyland!